This class is designed for young children with an interest in learning to sew. Exception: if the child is 8 yrs (minimum age) and experienced with sewing then we can accept from 8yrs. If they are between 10 and 15 years and have no experience this class is still perfect for them. 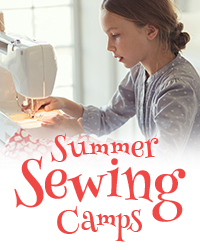 This class is great for those children who have sewed before or 12yrs+. If the children came to last year’s sewing club this would be perfect for them too. The projects are a little harder – some projects will be over two days to complete. If they have completed the intermediate class or is a home sewer or 14yrs+ and want to learn more complex sewing skills this would be a good class for them. 18 yrs + only, learn to read a pattern, bring your own machine or use one of ours!